When you arrive in a different country first thing you think about where to eat and drink? So in Barcelona city there are many good restaurants and pubs you can eat or spend a good time. Here in this article, we are going to try to introduce a special Italian Food Restaurant in Barcelona city called La Poma. If you travel or stay around La Rambla street on El Raval district this can be the best choice to taste Italian pizza and Mediterranean food in the city. Firstly we suggest you taste delicious tapas food and If you miss or want to try different kind of food it may be a good choice to spend lunch or dinner time in La Poma. What can we eat in Barcelona city in La Poma? The restaurant offers you lots of different delicious cuisine in Las Ramblas street. You can have caprese salad with rocket, tomato and basil oil, pizza kinds with porcini, gorgonzola cheese and caramelized onions. If you want to have fish menu you can try Catalan style cod with garlic mousseline. After you choose your lunch or dinner, you may want to have some dessert so we suggest you have brownie with walnuts and chocolate cream or homemade cheese cake. 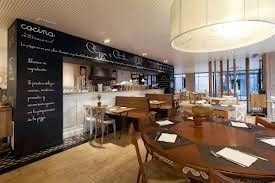 When you are in Barcelona, La Poma restaurant can be a good choice with its reasonable prices. A menu is approximately 20€. Is La Poma restaurant expensive? We think it offers visitors best prices in Barcelona city. 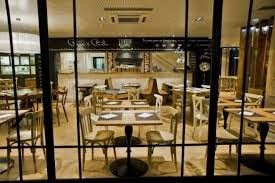 While you have your dish, big surronding windows will let you enjoy fantastic view of La Rambla street. 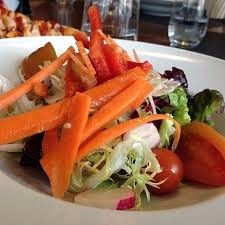 The restaurant offers us relaxing atmosphere. It is available for handicapped visitors. La Poma is informal restaurant so it is available for your private or group visits. For family meetings it is the best choice in Barcelona city. Even on Sunday, La Poma restaurant is open. Where to eat or drink in Barcelona city please keep on following your Barcelona city guide. If you want to plan your holiday in Barcelona city better we highly suggest you follow our articles for Barcelona city travel guide. 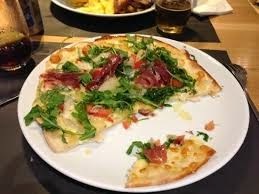 Enjoy pizza in La Poma. For best restaurant in Barcelona city, read our articles about food and drink. Address: la Rambla, 117 (Barcelona). Reservation may be required. Please contact to restaurant beforehand.